CoStrategix was a recent participant at the IRCE – 2018 (Internet Retailer Conference and Exhibition) we’d like to share a few insights about eCommerce re-platforming here. Many eCommerce businesses are looking to re-platform or modernize their eCommerce platforms. An informal survey presented at the conference indicates that over 52% respondents wanted to re-platform and that number is only growing by the day. 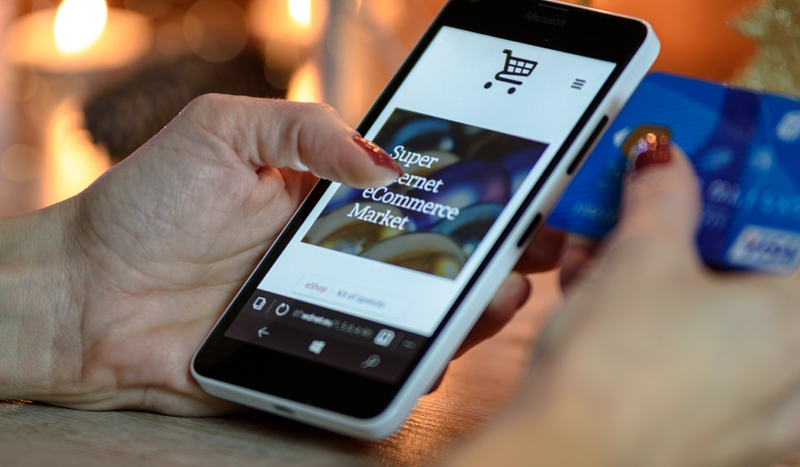 In fact, the term eCommerce is rapidly progressing toward becoming obsolete because the term Digital Commerce addresses a broader set of considerations quite important for underlying success. So, what exactly is Digital Commerce? How is it different from eCommerce? What are the factors that led to the evolution of Digital Commerce? eCommerce mostly meant replicating one’s traditional commerce approach to the web with an online presence of a business that generates an alternate stream of revenue. In today’s digital age, people are going to the store less and prefer to shop only online, especially on their mobile devices. Furthermore, there are millions of businesses that only exist online without any store presence. During this evolutionary growth phase, businesses have come to realize the importance of making shopping a rich, smooth and memorable experience – It leads to customer engagement, retention and ultimately loyalty which is extremely important in today’s fiercely competitive markets. It addresses all the searching, browsing, research, comparison and checkout aspects of the buying cycle. It heavily relies on content, which in its many forms, has come to play an integral part in influencing buying behaviors. Mining this data and drawing meaningful insights from analytics to optimize and improve processes, UI/UX and other aspects of the business is another important dimension of Digital Commerce. In order to move from being a plain Jane eCommerce product listing site to a digitally advanced online business, one of the primary considerations is to replatform i.e. move away from legacy technologies to newer platforms that support latest tech capabilities like AI, BI and Machine Learning. So, then how do you go about selecting a new platform? This is how things have traditionally been done – Systems perspective was the primary consideration in play if you were to pursue eCommerce. IT, often is in charge of this aspect. Key focus is on loose coupling – can I integrate with other “best of breed” systems to accomplish what I want at a balanced price point? This perspective primarily leans on whether new systems will integrate and work in tandem with each other to keep the existing system running or if the system needs a total overhaul. Security is another primary concern here – How will integration of new systems affect security? Hosting also is equally relevant – Now more and more businesses are moving to the Cloud. One more point of thought is scalability – Will the platform max out at certain scale of customers? Or can it scale with traffic, new features and marketing initiatives we will encounter in the next phase of growth? Another question that needs some pondering is whether the system can integrate content and commerce together tightly in seamless manner. There are many plugins – free and paid – available now that easily integrate with eCommerce systems. You need to consider which of them make sense to your eCommerce business – Do they justify the spend in terms of money and effort? Is there an ecosystem like the platform’s open community libraries where you have endless choice of free and paid versions of various plugins? This perspective is centered around the CUSTOMER. Everything is done keeping the customer and his/her ease-of-use in mind. UI/UX (user experience) is a crucial aspect of consideration so that the customer buying journey is simple and easy. Building a solid relationship with your customer is a lot more easier than it was a decade ago. Thanks to the internet, email and the number of social media channels that have become an integral part of our daily lives, creating and maintaining relationships is possible in a number of ways. But prior to engaging on social media, email or any other forum, making your product customer-friendly and one that fits their needs is of primary importance. Only when your customer loves your product will they follow you on social channels and would want to know more about updates from your business. Being consistently accessible in all contexts on-demand across channels is very important. eCommerce has progressed in the last few years thanks to technologies like AI, BI and Machine Learning. Now is the era of product recommendations, count of how many people bought a particular product, what other products are people buying/considering, product comparisons, and other similar suggestions and recommendations. Displaying such highly relevant content along with product listings is the norm today. When you are considering eCommerce replatforming, if the customer is your top priority and this perspective is your choice, then these technology considerations must be a part of your decision. You must join hands with a digital partner who has proven experience in handling such transformative projects with deep technical expertise. This perspective is of equal substance, if not more, in today’s aggressive markets. For every product, big or small, right from groceries to technology, every business has to compete with not just the big players in the industry but with up-and-coming local small and midsize businesses as well. In such a scenario, knowing your customer thoroughly provides you with an edge over your competition. So how can you get to know more about your customers? The answer is straightforward: By collecting relevant information about them at every single touchpoint. So when you replatform, a key consideration in the Analytics perspective is whether the new platform will allow you to collect valuable information about your customer at every available opportunity. Further, does it provide mechanisms to use the insights collected to drive and incetivize customer behaviors? For instance, when your customer is browsing on your website, you can collect data on what product they are interested in, what size/quantity/color, etc and show relevant options. When they sign up or place an order, you get to know a lot of their personal information – For instance, if your customer browses or orders baby products, you know there is a baby in the house and you can display relevant products. When they visit your store, you get to know what brands they like. There are many questions that crop up when we delve into data collection and mining to derive meaningful insights: Can your new platform respond to changes on a subsecond that is informed by analytics to show another product because we know something that will make it compelling for the customer to buy that instead of the one they are viewing? Can it easily integrate with other Systems of Insight to help you make better decisions and ultimately lead to higher conversions? Give us a shout out to help you answer these questions with our solutions. Ultimately, the IT point of view is almost on the brink of becoming obsolete. 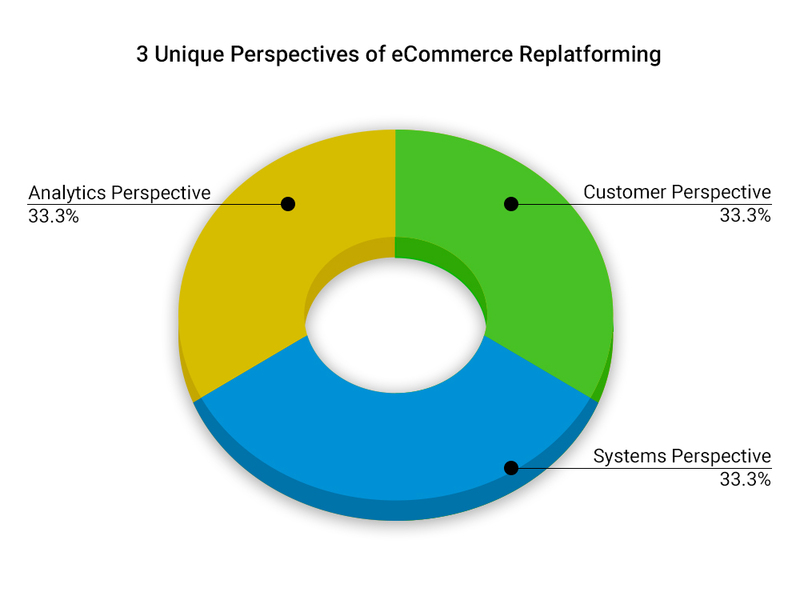 Even though some aspects of the Systems perspective like Security and Cloud are still very relevant, an astute decision on eCommerce replatforming cannot be solely based on the Systems perspective anymore. Customer and Analytics perspective are extremely relevant to future proof your competitive advantage. After all, your customer is the most important cog in the wheel of your business – so is valuable information about them. So, in summary, it is important to consider these three major categories of factors into your decision making when selecting a new platform for your Digital Commerce.